Depending on your needs, you can choose from among 20 options comprising 12 rooms and 8 suites. The fully equipped apartments are right on the beach Paradise and have a private veranda with a view to the sea. 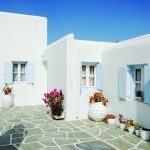 Yakinthos Residence is a family owned & managed compound located in Panormos bay, one of the most famous beaches in Mykonos.